3 reusable Produce Bags with drawstrings suitable for fresh produce such as fruit and vegetables. Simply shop, wash and store. Size: 32cm x 32cm. 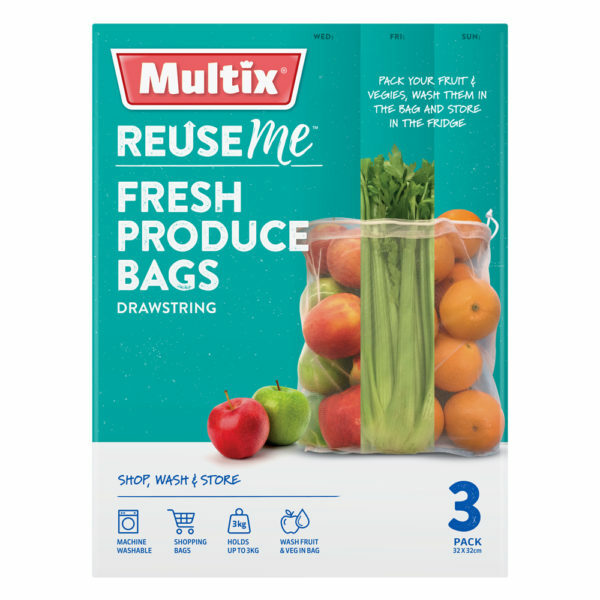 Take Multix ReuseMe™ fresh Produce Bags with you when you shop for extra convenience and less plastic bag pollution. Simply pack your fruit and vegetables in ReuseMe™ Produce Bag, wash them in the bag and store in fridge. ReuseMe™ Produce Bags are machine washable and can hold up to 3kg. Wash & Care instructions: Warm machine wash on gentle cycle.